Peppermint Mocha Matcha Latte - Sugar-free & Vegan!Peppermint Mocha Matcha Latte - Sugar-free & Vegan! 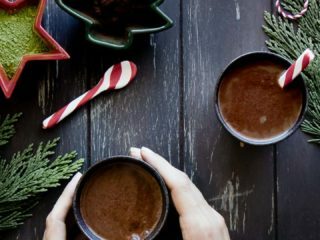 Peppermint Mocha Matcha Latte, a minty take on traditional hot cocoa made with peppermint oil, unsweetened cocoa powder, matcha, and plant-based milk. Perfect for the holidays…sugar-free and vegan! Add matcha and cocoa powder to a small bowl or mug. Add hot water and whisk well to fully dissolve powder into hot water. Pour hot milk over dissolved matcha and cocoa. Add peppermint extract and sugar or candy cane, if using. Leftovers & Storage: I recommend to make each cup of matcha before drinking and not make in advance. Nutrition: This simple mocha latte matcha with matcha is low in fat, calories, and full of antioxidants from the cocoa and matcha. It is an unsweetened treat, but is also delicious with a small amount of sugar or maple syrup.